Since Boothbay Harbor is “home base” for me, this session is the result of often-asked questions such as “Why don’t you have a workshop right here?” and “Why would you ever want to leave this place?” You asked for it and here it is! In fact, Down East magazine listed our town as number two of Maine’s prettiest villages. 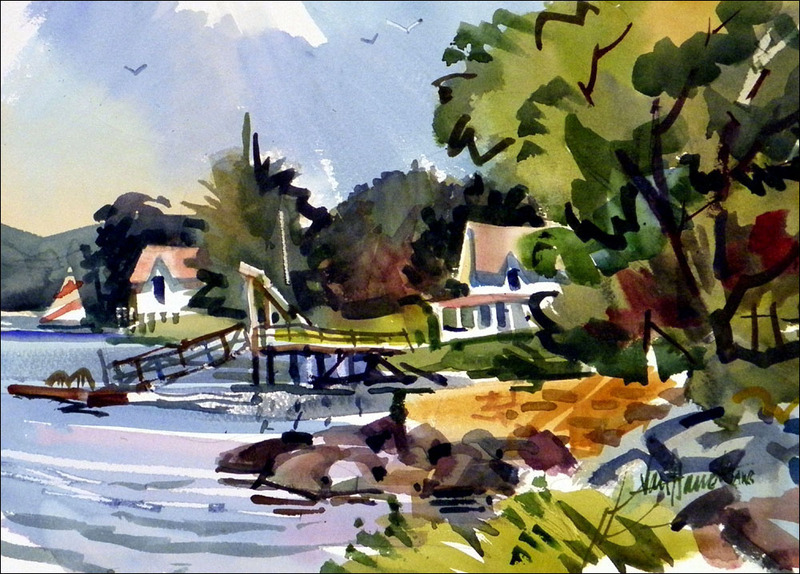 With an art colony history reaching into the present, Boothbay Harbor is at the center of all activities. It offers shops, restaurants and a bustling bay teeming with lobster boats, sailing ships and pleasure craft. 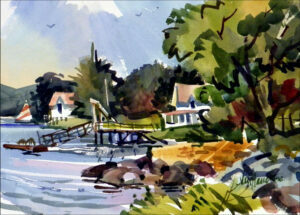 In contrast, Southport Island offers a more sedate charm with hidden coves and quiet inlets to delight the artist’s eye. Painting subjects abound. There are lobster shacks on rickety docks stacked with fishing gear and traps, the rocky coastline of Ocean Point in East Boothbay, plus many of my favorite sites in the area. I encourage sketchbook journaling to create memories of an area and often use those sketches as preparation for larger efforts. Although drawing ability comes first, my focus is on the art of picture making, composition and design, applicable in any medium. All demos will be in watercolor, but painters using acrylics are welcome. Enjoy lots of painting time with personal assistance in the area needed. 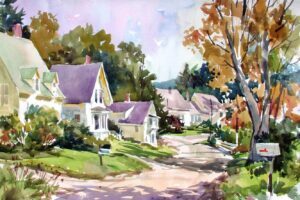 For studio painters, this plein air workshop may serve as an introduction to working on location, while finishing touches can be added in a studio environment. In the late afternoon meet in the studio, where I’ll show how to improve your efforts. Since artists are visually oriented, I give not just verbal suggestions, but often paint them on clear acetate placed over your painting. 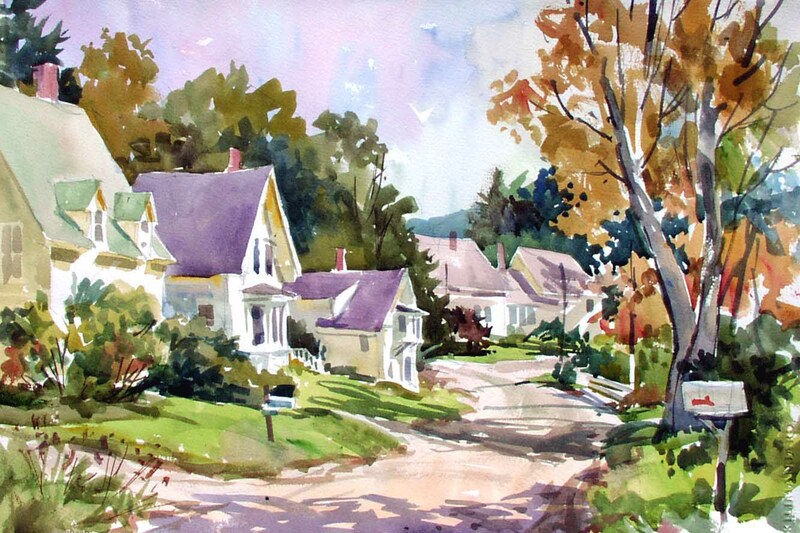 Photograph the result and if desired, use it as a guide to complete the painting. Actual work is never touched. Tuition 5 days $650.00. 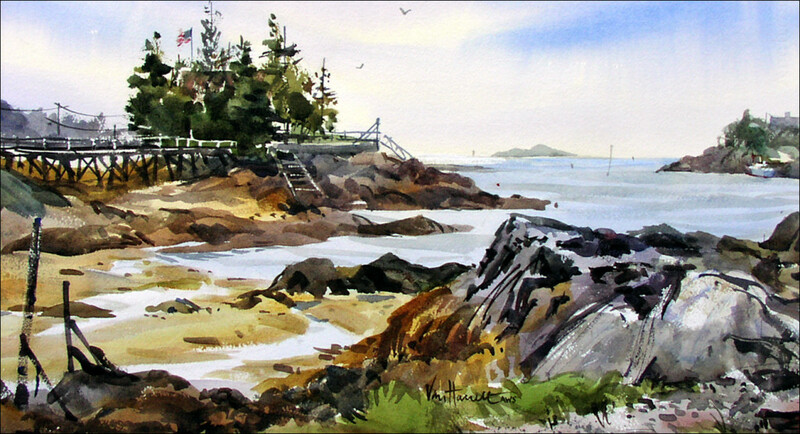 Invite a painting friend and enjoy a $50.00 discount each, deducted from the tuition balance! Want to join me for the first 3 days? Tuition $375.00. Sorry, no discounts. CLICK HERE to safely register online. Check my books and DVD’s below. Click on each image for details.